The murky Rio Chama meanders through the high plateaus of northwestern New Mexico surrounded by multi-colored sandstone cliffs reminiscent of Georgia O’Keefe’s landscape paintings in which colors seem to defy nature. The ambiance at the Rio Chama Steakhouse is of muted earth tones and subdued Southwestern patinas. Exquisite elegance is in evidence throughout the restaurant as this truly fine dining establishment exudes class and wealth. Serving prime and choice dry aged steaks, chops and seafood, this high-end and classy establishment has garnered accolades since its inception–Cocinita Magazine’s Critics’ Choice Award in 2001 and the Santa Fe Reporter Readers’ Choice award for best new restaurant in 2001 and 2002. 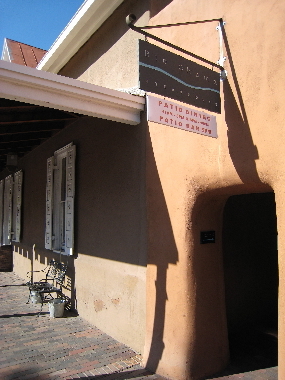 It is the sister restaurant to Santa Fe restaurants La Casa Sena and the Blue Corn Cafe as well as Albuquerque’s Chama River Brewing Company, all properties of Santa Fe Dining, the restaurant company owned by Santa Fe art dealer and developer Gerald Peters. An excellent lunch, brunch or dinner starter choice are the roundhouse rings, five lightly breaded jumbo onion rings “cut bigger than they out to be” and served with dueling dipping sauces of chipotle catsup and horseradish mayonnaise. These are a perfect prelude to how great the rest of the meal will be. If house salads be your choice, ask for the blue cheese vinaigrette dressing that you’ll rave about for days. Rio Chama’s full rack of slow-cooked pork baby back ribs glazed with a sweet and tangy barbecue sauce is easily among the best rack of ribs I’ve had in New Mexico. They are off-the-bone tender, finger-licking delicious and absolutely succulent. Meatatarians will also love the perfectly seasoned steak asada, a filet of prime sirloin dusted with a slightly piquant rub. It is an amalgam of flavors with juiciness expertly sealed in. For dessert share a “chocolate pot” with someone you love. This light chocolate soufflé is served warm and accompanied by vanilla cream. It’s a dessert that’s beyond decadent, beyond delicious…maybe even sublime. Sunday brunch is also a not-to-be-missed event at Rio Chama. A seven ounce version of the steak asada is available with cubed potatoes and eggs any way you like them. A more eye-opening and unexpected brunch surprise were the red chile chicken enchiladas. In northern New Mexico, you’ll find few better (only El Bruno comes to mind) thanks to a perfectly piquant rich red chile and a tortilla adorned with sharp cheddar cheese enveloping perfect poultry portions (if I’m using the adjective “perfect” too often, it’s warranted). The enchiladas were accompanied by some of the best restaurant made pinto beans we’ve had in a while. The beans were flavored with bacon and miniscule bits of green chile.